"The story of Silver Hills Sprouted Bakery is as organic and natural as the ingredients in our breads and bagels." Our story began in 1989 at the Silver Hills Guest House, a wellness resort quietly tucked away in the beautiful and serene Okanagan Valley of British Columbia. Rooted in a philosophy of holistic, healthy living, guests to the resort are taught the benefits of positive lifestyle choices supplemented by a vegan-friendly diet as a means of promoting health and achieving a higher quality of life. Soon after opening its doors, the resort staff discovered they were unable to find wholesome, all-natural bread that aligned with their dietary values. Fortunately, Brad Brousson, the soon to be co-founder of Silver Hills Bakery, was on staff at the time. When he was young, his mother had taught him the craft of baking bread using sprouted grains, and as a result Silver Hills decided to make its own unique sprouted bread. Instead of grinding grains into flour, the bread was made from sprouted organic whole grains. This naturally retained all of the life-giving nutrition of the entire living kernel to create delicious, wholesome bread that was packed full of fiber and protein, while also containing no dairy, oil, artificial preservatives or additives of any kind. After experiencing this healthy and delicious new bread, resort guests wanted to continue to enjoy it after returning home, and share their discovery with friends and family. The demand for our organic sprouted bread only grew from there. To this day we have two simple goals: bake wholesome, great tasting bread and inspire healthier living through healthier choices. The Squirrelly Bread is high in fiber. 5 grams per slice to be exact. The bread is FULL of sesame seeds and sunflower seeds. 110 calories per slice, 2 grams of fat an 6 grams of protein. Organic whole sprouted wheat, raisin nectar (raisins, water), vital wheat gluten, sunflower seeds, sesame seeds, cultured wheat flour (wheat flour, bacterial culture), yeast, water, sea salt, organic sunflower oil (used only on the equipment not as an ingredient). *Contains wheat and sesame seeds. May contain organic soy. Made in a peanut and tree nut free facility. Wealthy, talented, fiercely loyal. He’s the glue that holds his family together, but every man has a breaking point. When he heads to Ohio to attend a funeral, he does so with the intention of taking time off to clear his head. The very last thing he expects to do is meet a woman. Cassie was glad Luke had decided to drive back because her hands were shaking with a mixture of excitement and nerves. They tried to make light conversation, but the sexual tension between them was too much to sustain a topic. They walked into her kitchen together; the mounting anticipation was palpable. Cassie didn’t realize she was hanging onto the doorknob until Luke gave her a curious look. He swung her up in his arms and carried her out of the kitchen, up the stairs, and into her bedroom as if she were precious to him. Cassie buried her face in his neck and clung to him. His consideration for her almost brought her to tears. She was used to people who took from her. Even if he left before she woke in the morning, she wouldn’t regret choosing to be with him. He wasn’t like the fumbling boyfriends she’d had in high school, or the selfish short-term lovers she’d experienced as an adult. He was a man who knew how to please a woman and intended to enjoy doing that. She was an educator for 20 years, the last 11 as a kindergarten teacher. When her school district began cutting jobs, Ruth turned a serious eye toward her second love- writing and has never been happier. 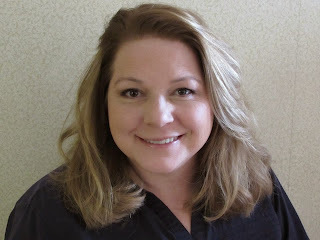 When she's not writing, you can find her chasing her children around her small farm, riding her horses, or connecting with her readers online. Scott Turansky, D.Min., and his wife, Carrie, have five children. Dr. Turansky directed a preschool for eight years and is presently a counselor and seminar speaker and lives in Lawrenceville, New Jersey. Scott is the cofounder of the National Center for Biblical Parenting and the pastor of Calvary Chapel Living Hope. Scott is committed to helping parents understand a heart-based approach to parenting. Although many parents use behavior modification to try to change their kids, Scott believes that approach is incomplete because it doesn’t consider the fact that God created every person with a heart. That realization opens many new avenues to help parents work with their kids. I have a 3 year old son and a 4 month old son. Being a parent, I need to make sure that my children go down the right path. I know not ever path is going to be the right one, but with the help from this book, I can make sure that my sons most important paths are taken seriously. It's great to encourage my kids to not only have a great heart but to follow their hearts. Using this book, you'll be able to teach your children morals, personal responsibilities, strength and confidence. To give them punishments but in a positive way. When you purchase the book, you get (12) 30 minute segments. One for each chapter. I really love how the book has places within the chapter where you can take notes or jot down ideas. A great Christian book on parenting. A great read! Welcome to the Green Toys Summer Bundle Giveaway, hosted by Karen’s Got Mail! I have teamed up with a great group of bloggers to bring you this giveaway! One lucky reader is going to win this Green Toys Prize Package (ARV $60). To enter just use the Giveaway Tools form. Giveaway is open to US residents. Giveaway is open from 5/25-6/8. Disclosure – The participating bloggers were not compensated for this post and are not responsible for prize fulfillment. One winner will be randomly chosen by Giveaway Tools random selector and notified via email by Karen’s Got Mail. Enter to Win a Bugsy's Box Giveaway! 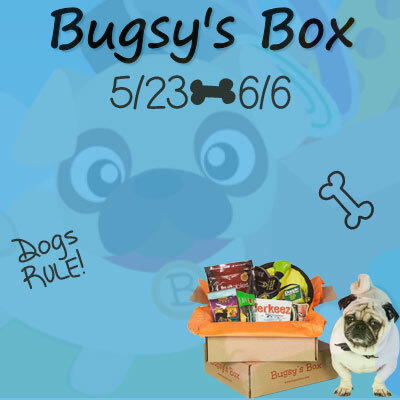 Every month, get a box with 3-5 full size dog products, and misc samples and goodies, all approved by Bugsy's Box. Disclosure- A Sampling Bee did not receive compensation fort this post and is not responsible for prize fulfillment. 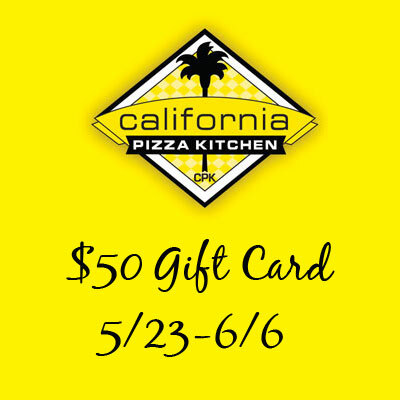 Enter to win a $50 California Pizza Kitchen Gift Card! Disclosure- A Sampling Bee did not receive compensation for this post and is not responsible for prize fulfillment. Switching to rechargeable batteries would be a lot better for the environment. In the United States alone, each year 2.9 billion batteries are thrown away with 179,000 Tons of them ending up in Landfills. That's a lot! SunLabz batteries can be charged up to 1000 times! The batteries are available in packs of four, eight and even sixteen! They worked okay. I put them in my sons baby swing. I got a maximum of two uses until I needed to charge them again. The swing ran for about six hours. Which is nothing compared to how long I've gotten out of Duracell's D batteries. Duracell's batteries allowed the baby swing to run for days.. Maybe I just received a bad batch? I've read a lot of reviews on Amazon and it seems that a lot of people have had good luck with them. Just not me.. Try them, and let me know your results! Disclaimer- I received these batteries in exchange for my honest review. All opinions are my own! If you have any questions, please feel free to shoot me an email at acraftyhoneybee@yahoo.com. Hey there! Today, on the blog, I have an awesome Infuser Water Bottle! I had a ton of fun using this bottle and I know that you will, too! Especially if you love water infused with fruits and vegetables. Read on.. The FlavFusion 25 oz. Flip Top Infusion Water Bottles are ideal if you are looking to kick the soda habit and aren't crazy about drinking plain water. They have a clear, single wall body with a grip providing an easy non-slip hold and are made of top quality Tritan Plastic. The bottles are BPA Free. It features a locking flip up sipper lid for easy drinking on the go and a large opening for easy filling and cleaning. It's light weight and easy to use, can go anywhere and it fits most cup holders. Just fill with water and add your favorite fruit whether it be Strawberries, Raspberries, Pineapple, Lemons, Limes, etc. Vegetables like Cucumbers or celery are also great. Close the lid, shake and ENJOY! Leave it in the refrigerator overnight for an Intensified Infusion! Available in the following colors: blue, orange and red. The bottle comes with these pieces. You can fit quite a bit of fruit in the strainer. If you are like me and you love fruit infused water, this bottle is for you. Its super easy to use. Just fill the strainer with your favorite fruits or vegetables, fill bottle with water then assemble the bottle! The bottle is super easy to clean. The no slip grip located on the sides of the bottle makes it easier for you to hold onto it. The locking lid gives you peace of mind knowing that your water bottle will not spill at the gym or while using in the car. The pieces assemble quickly and easily. Having the option to choose what you put into the strainer is great. A great alternative to sugary sodas. The sugars in the fruit(s) gives the water just enough sweetness. Infused water is sooo much more healthier for you than soda! Stay hydrated! This bottle was a huge hit at my house. My 3 year old loves it and has been snatching the water bottle from me! The bottle is hand wash only. Do not put it in the dishwasher! Can with warm, soapy water. The bottle can be used with hot liquids, but it is not recommended. If you choose to use the bottle with hot liquids please allow the liquid to cool a bit. Do not microwave. Hello, again! I am so happy because I get to share with you yet another EXCELLENT sauce from Nello's! Introducing.... Lavender Piedmont Pomodoro Sauce! One word: Elegant. Features lavender and thyme. A unique sauce for the cook looking for something modern and innovative. Soft, yet rich tomato flavor with an herb and floral profile. Pairs with bread, pasta, cheeses, pork, poultry, game, or fish. Available in 14oz and 25oz. Place eggs, water, whole wheat flour and salt in mixer bowl. Attach bowl and flat beater. Turn to Speed 2 and mix for 30 seconds. Exchange flat beater for dough hook. Turn to Speed 2 and knead for 2 minutes. Remove dough from bowl and hand knead for 2 minutes. Divide dough into eight pieces before processing with Pasta Sheet Roller attachment. Cook pasta in 6qts of boiling water. Add 2 tsp of salt to water if desired. Cook pasta for 2-5 minutes, fresh, or 7 minutes dry. Add a heaping amount of Nello's Lavender Piedmont Pomodoro Sauce and Viola! Dinner is served! This last bite of pasta says it all :) I really love this sauce. Its definitely different from any sauce that I have tasted. Its savory, fresh and delicious. I can really taste the floral. I'd say that this sauce would be good for any dish. My mouth is watering just thinking about it! The length of the cord is 4 feet. Equipped with a 3.5mm gold-plated adapter plug. Suitable for all gadgets like iPhone, iPad, Android phones, MP3 players, etc. They fit comfortably in my ears but they do not give off the best sound. The noise coming out of the ear phones sounds muffled. To me, the sound quality has to be perfect when I'm listening to my music. With these, I just don't get that. The cord is a nice length. It's not too long where it keeps getting tangled. And, it's not too short. The adapter fits easily into my iPad and computer. When ordering these earbuds, you do not receive the rubber pieces in different sizes. You only get the size that is already on the earbuds. And, as you can see in the picture above, the rubber piece on one of the earbuds is crooked. I tried fixing it. No luck. I would recommend these to anyone who does not want to lose their expensive earbuds while traveling. Also, everyone is different. Just because these earbuds don't fit my needs, it does not mean that they won't fit yours. So, if you want to, give them a try. They come with a 100% money back guarantee. 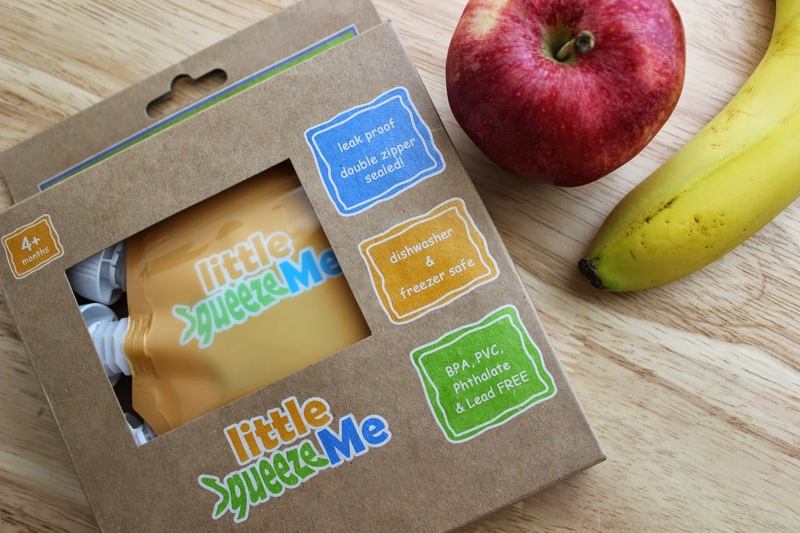 Little SqueezeMe Reusable Food Pouches Review & Giveaway! Little SqueezeMe pouches are very durable and are made with the highest quality materials available. Leak free and easy to fill with extra strength Double Zippered pouches. No filling station needed! Just pour or spoon in through the wide top zipper opening. These big reusable pouches are earth friendly and is BPA, Phthalate, PVC and Lead Free. For every purchase, 2 foundations will each receive $1 to support MOMS and BABIES. How awesome is that? Great for yogurt, homemade purees, jello, pudding, protein shakes and you can even use a pouch as an ice pack! I'd even use it to make pancakes easily. Great for on-the-go, lunch boxes, picnics, camping, etc. They are super easy to clean. Super easy to fill. I love the fact that they are reusable and recyclable. When I buy the puree pouches at the store, I always feel so bad because I know it'll go into a landfill. Not these! Reuse over and over! I also love how I have control of what goes into my purees. Homemade is always healthier. They are dishwasher and freezer safe. Perfect for little hands. The zipper is at the top of the pouch. Which makes it leak-free. The pouch is designed with a clear fill line on the back which allows you to measure out your food. The pouch also contains a label where you can put a name, date and/or contents. Use a dry erase marker and easily erasable. Your kids will LOVE these reusable pouches :) Enter below to win your own! I received this product in exchange for my honest review. All opinions are my own. If you have any questions or concerns, please email me at acraftyhoneybee@yahoo.com. One lucky reader is going to win one Little Tikes Big Digger Sandbox (ARV $49.99). To enter just use the Giveaway Tools form. Giveaway is open to US residents. Giveaway is open from 5/2-5/16. Midori Spring's Ceremonial Gold Matcha - is a ceremonial grade (premium) green tea used for brewing the finest most flavorful drinking tea you'll ever taste. This is NOT a cooking grade powder (although it can be used for cooking if you prefer), the quality is so high that it is primarily reserved for tea ceremonies for it's full flavor, and health benefits. Rich, smooth and creamy with a hint of sweetness when brewed traditionally. This premium product is Ceremonial Grade and is Organic (USDA, JAS) and Kosher (OU) Certified. They only select the best raw material from their tea gardens mostly from Aichi and Kagoshima in Japan and maintain the highest standards in production. The Matcha has a fresh, sweet, green-vegetable-like aroma. The color is a vibrant emerald green. Only high quality Ceremonial Grade Matcha encompass these features. You can enjoy Midori Spring's Ceremonial Gold Matcha the traditional way by brewing or you can create your own Matcha inspired recipe. Whichever style you choose to have your Matcha, you can experience the many health benefits it has to offer since Matcha is a Superfood. Opening up the lid to this Matcha and I immediately can tell that this is the best of the best. The smell of it is awesome and sweet! All you'll need is about a teaspoon for and 8 ounce cup. You can also blend a teaspoon of Mathca in with your favorite smoothie. I love a banana and Matcha smoothie. Yum! If you are not use to raw Mathca, I'd recommend adding a little sugar. I used one pack of Sugar in the Raw to sweeten up my tea a bit and it was just enough! And, it's good to have either hot or cold. You can really taste the quality in this Matcha and its health benefits are exceedingly good! Midori Spring Ceremonial Grade Organic Matcha is GLUTEN FREE, GMO FREE, and contains no pesticides, soy, wheat of any kind.